Be the first to share your favorite memory, photo or story of Louise. This memorial page is dedicated for family, friends and future generations to celebrate the life of their loved one. 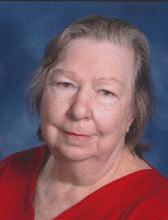 Louise Grigg Gardner, 74, of Waco, passed away Monday April 8, 2019 at Carolinas Medical Center in Charlotte. Born April 11, 1944 in Cleveland County, she was a daughter of the late Lawrence T. Grigg and Dorothy Davis Grigg. She was a homemaker and a dedicated member of New Prospect Baptist Church where she was a former Sunday School Teacher, choir member and Bible School Director. Louise loved cooking, volunteering at church functions and serving others. She was a loving and devoted wife, mother, grandmother and great grandmother. Her greatest love was spending time with her family. In addition to her parents, she was preceded in death by her husband of forty-seven years, Ralph Beam Gardner and one brother, James Grigg. Survivors include two sons and daughters-in-law, Gil and Kelly Gardner of Shelby and Larry and Lori Gardner of Cherryville; five grandchildren, Craig Gardner and wife Yui, Tiffany Gardner, Morgan, Lillian and Madison Gardner; one great-grandchild, Titus Gardner; brother, Everette Grigg and wife Maria and two sisters, Evelyn Kiser and husband Keith and Carolyn Efird and husband Neal all of Cherryville and numerous nieces and nephews. The visitation will be 6:00 PM to 7:30 PM, Thursday at Stamey-Tysinger Funeral Home. The funeral service will be 11:00 AM, Friday at New Prospect Baptist Church with Rev. Chris Devine and Rev. Neal Efird officiating. The body will be placed in the church thirty minutes before the service. Burial will follow in the New Prospect Baptist Church Cemetery. Memorials may be made to New Prospect Baptist Church Youth Fund, 1960 New Prospect Church Road, Shelby, North Carolina 28150. A guest register is available at www.stameytysingerfuneralhome.com. Arrangements have been entrusted to Stamey-Tysinger Funeral Home and Cremation Center. To send flowers or a remembrance gift to the family of Louise Grigg Gardner, please visit our Tribute Store. "Email Address" would like to share the life celebration of Louise Grigg Gardner. Click on the "link" to go to share a favorite memory or leave a condolence message for the family.